It’s still very hot in Tokyo! And that goes just towards today’s Kanji Tip! It’s read ざんしょ (zansho) and it literally means “lingering summer heat”! It’s a very commonly used word around this time of the year. The first kanji 残 is use in the word 残る (のこる, nokoru), which means “remain”. 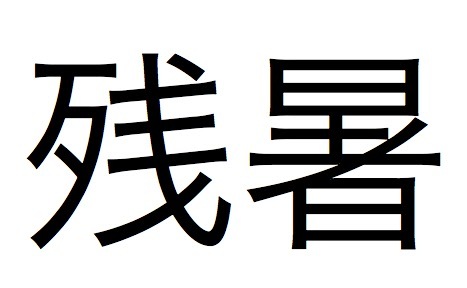 The second kanji 暑 is used in the word 暑さ (あつさ, atsusa), which means “heat”. The meaning is just a conjugation of those two words! And that’s it for today’s tip! You might wonder why the reading in the word above and the readings of the examples I gave differ, and it is indeed a good question which I will be answering next time!